Winter, when grape vines are dormant, is an ideal time to plant this member of the Vitaceae family, but wait until the risk of frost is over. 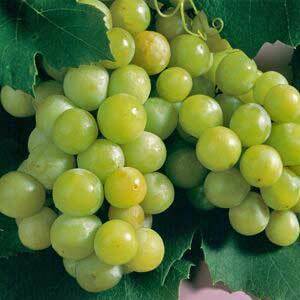 Properly sited and cared for, the vine will produce multiple bunches of juicy fruit in late summer or autumn, and the fresh, green leaves also create great summer shade before turning a gorgeous golden colour in autumn. They give a truly Mediterranean effect when grown over a pergola, balcony or deck, with the added benefit of letting in the winter sun once all the leaves are lost. Grapes like hot, dry summers and cool winters – choose a site with full sun and good air movement – a north or northwest facing one is ideal, with well-drained, light-textured soil. They are not nutrient hungry — don’t overdo fertilisers, especially high nitrogen ones or your vine will tend to grow leaves at the expense of fruit. Mulch vines with generous amounts of compost once or twice a year and keep the base weed-free. They also enjoy a regular light liming — you can add bone dust or crushed shells when planting as an alternative source of calcium. Vines need strong support — they will reach a height of 1–3m and a spread of 3m or more if unchecked. Make sure whatever support you use is in place before your grape is planted, because young growth is easily broken if left unsupported. They also need pruning more than any other fruiting species — irregular or poor crops are produced if the vine is not pruned and trained. There are two different forms of pruning, both undertaken annually when vines are dormant in winter. Spur pruning is excellent for training vines over pergolas and fences. The first winter after planting select the strongest and longest stem for the main stem, and remove all others. Train two shoots along your support to form the side arms of the T (called a cordon). 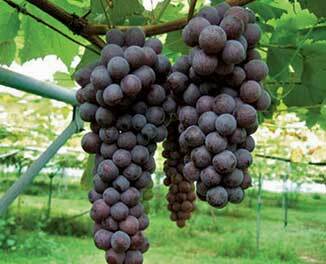 Each year cut all growth off the T-shaped vine except for a few two-bud stubs, each 30cm apart along the arms. The following winter cut out the cane produced by the top bud and cut the bottom cane down to a two-bud stub again. With the second method, cane pruning, two canes are left on each side and trained along a support. Each year remove all growth, but leave 2–4 canes of 12 buds length on each side — also leave a few two-bud stubs to provide next year’s canes. Most established grapes survive and fruit well without regular watering, but in a drought you’ll need to provide sufficient water to prevent the vine becoming stressed. 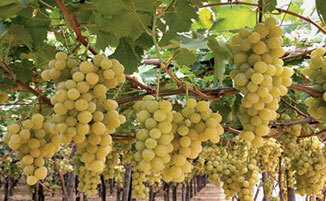 Be prepared to share your crops with birds, who love grapes, or cover ripening bunches with a net. Popular proven varieties include the old garden favourite, ‘Albany Surprise,’ a disease-resistant, heavy cropper with black, aromatic fruit which ripens from March to April, the heirloom green-gold grape ‘Niagra,’ which produces large clusters of sweet, juicy fruit with a mild flavour in February/March, ‘Italia,’ a golden-yellow grape with a musky flavour, ripening March to April, and ‘Bishop Pompalier,’ a disease-resistant, large, black grape with a sweet flavour.